Located in proximity to the Asaba International Airport, Asabana Suites is at 12, Onuorah Close, Umuagu, Asaba, Nigeria. The rooms available at Asabana Suites are air-conditioned and fitted with flat screen TV, wall paintings, mini fridges, a standing fan, a reading desk and chair, a makeup mirror and an en-suite bathroom. 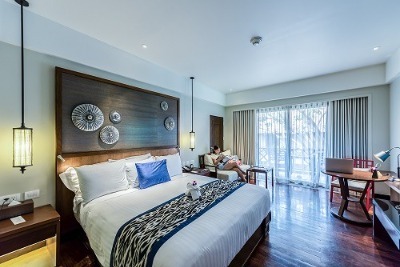 These rooms are categorised into Standard, Deluxe and Executive Rooms. Free on-site parking and 24 hours electricity are available at the hotel. An on-site restaurant serves mouth-watering meals of local origin and also provides breakfast, lunch and dinner at a surcharge. It has a well-stocked bar where guests can enjoy a wide range of drinks. The hotel complex is guarded ny security personnel. Asabana Suites offers additional services, such as laundry/dry cleaning, car hire, ironing and 24 hours room service, on request. The nearest airport to the hotel is the Asaba International Airport which is a 20-minute drive away. Children: All children not older than 15 are allowed to stay for free. Q: Does Asabana Suites offer free Wi-Fi? A: No, free Wi-Fi is unavailable at the hotel. Q: Does Asabana Suites have a swimming pool? Q: Does Asabana Suites offer complimentary breakfast? Q: Is there a fitness centre/gym at Asabana Suites? What type of equipment are available? Q: Does Asabana Suites have a restaurant? A: A restaurant is available at Asabana Suites. Q: What is the check-in and check-out time at Asabana Suites? Q: Does Asabana Suites offer car hire services? A: Asabana Suites renders car hire service on request. Asabana Suites is an affordable hotel in Asaba, Delta. Their staff were organised and well trained. The environment is cool, clean and very conductive. Everything about this hotel was superb. I am happy I chose this beautiful place. My stay at your hotel was just very nice. First it wasn't difficult to locate and When I got to the hotel, I was received nicely. The staff are polite and very helpful when need be. I liked your hotel very much. Have nice pictures of Asabana Suites ?